I always was a fan of Li Edelkoort. From the moment I heard her speak for the first time, years ago on a future summit, I found her inspirational and at that time influential on fashion colors, prints and fabrics. Her trend books were bought, also at that time, by the biggest fashion & lifestyle brands, to base their designs on for the next coming years. 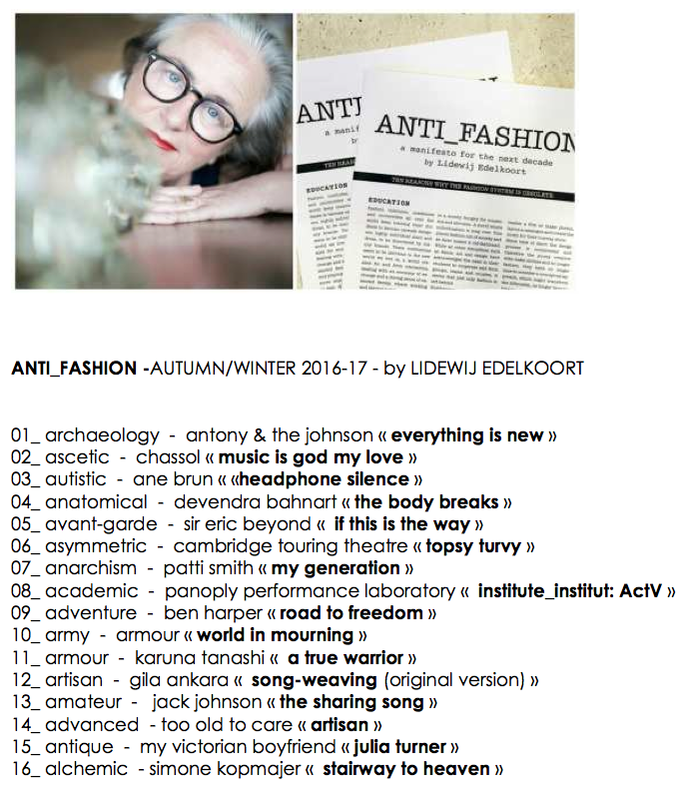 Lidewij Edelkoort, born in the Netherlands in the 50ties, founded the established trend forecasting company TRENDUNION based in Paris. She and her team advise fashion companies and consumer brands around the world. Time magazine named her once one of the 25 most influential people in fashion. So Li highly influential? For sure, but I could not help myself thinking that this was a system of ‘self fulfilling prophecies’. If everybody buys your directions, it is logic that it is a question of time that these predictions/inspirations are all over the streets. This is where she lost me for a while. But years later, now I myself am highly involved in what happens in the world and why, she slowly got into my mind again. I got to know her in person, we had already some chats after her lectures in London and in Amsterdam and I pop into her sometimes at the Milan Salone Di Mobilé or the Dutch Design Week. What is great to notice is that Li herself, incredible influencer as she is, found it time to use that influence to shake things up, take responsibility on what is wrong with the world and initiate projects to do something about it. 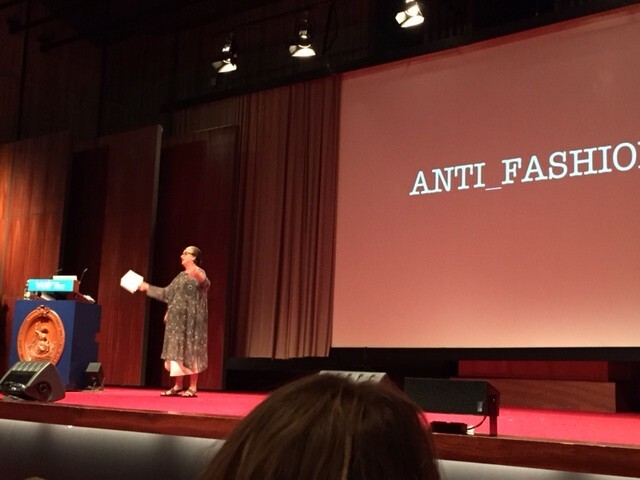 I had the chance to talk with her two weeks ago, after her already legendary anti-fashion manifesto she held in Amsterdam. “It al started when, after carefully writing (and rewriting) my manifesto, I shared my insights with a small group of friends. Just to check out what the reactions would be”, she explained. 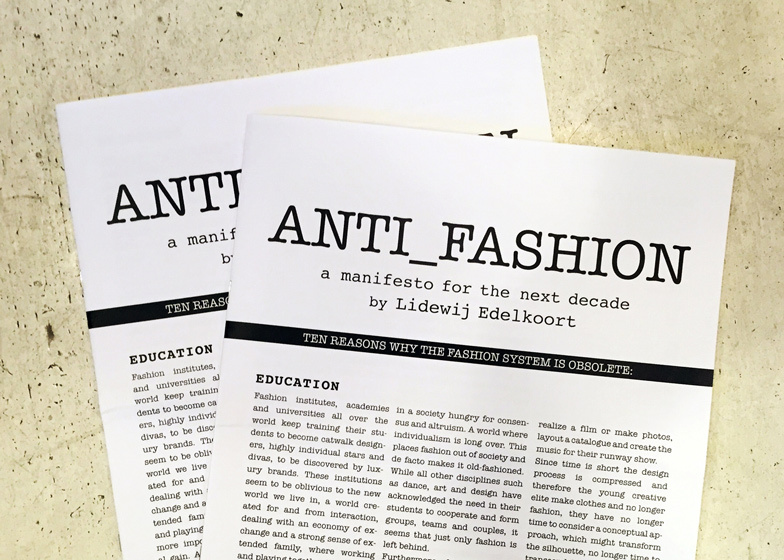 Than Edelkoort presented her 10 point Anti_Fashion manifesto (subtitled “Ten reasons why the fashion system is obsolete”) in premiere at Design Indaba in Cape Town in Februari 2015. Dezeen, an international online magazine & showcase of architecture, design and interior projects was there, and they published it as groundbreaking and provocative. It was clear that I wanted to hear Edelkoort talk live about her manifesto. Edelkoort started in Amsterdam her session with an anecdote about tree woman leaving Barney’s in NY, talking about there was ‘nothing’ in the store. A store with a least 18.000 references, and nothing they liked…. For Li the start of a thinking process on the actual meaning of fashion, especially in the luxe industry. Quickly she realized fashion has become a ridiculous and pathetic parody of what it has been, the industry was going to ‘implode’ and she had to do something. The manifesto speech is divided into 10 chapters dedicated to topics including education, manufacturing, designers, retailing and marketing. Students are being trained “to become catwalk designers, highly individual stars. 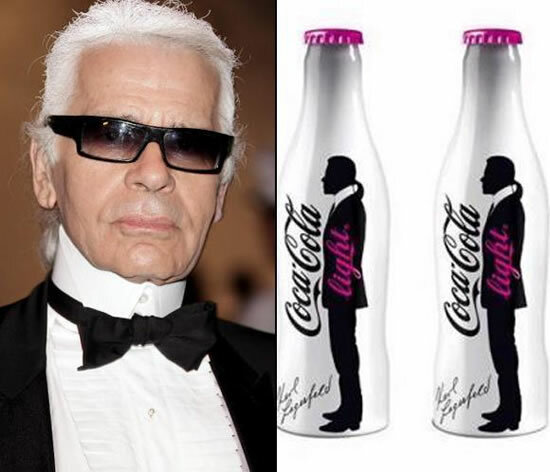 They have to become ‘little Karl’s’, to be able to do everything, from making pictures, organizing catwalk events, make music, and less time to work on the essence: the clothes. 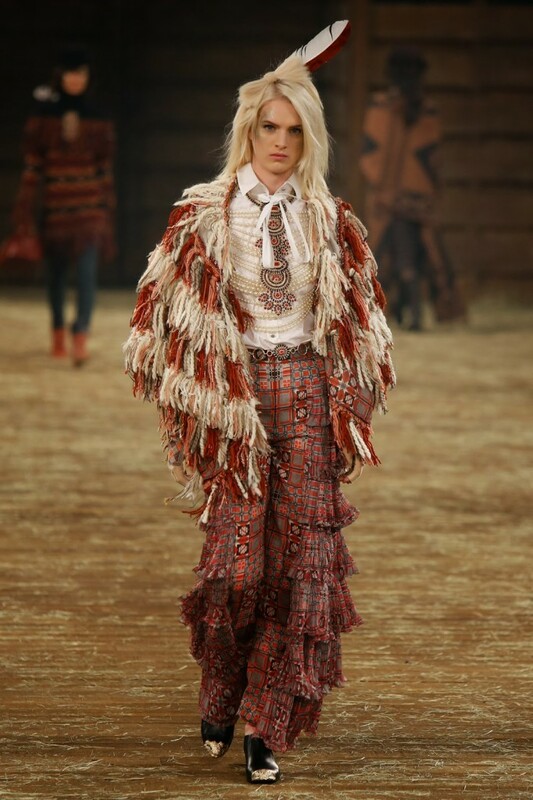 Fashion is like football, expensive transfers of star designers from one label to another. 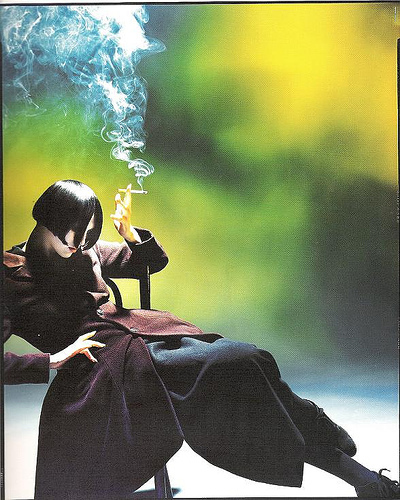 We haven’t seen any real new silhouette in fashion after Alaïa, Montana, Romeo Gigli, Mugler and the Japanese wave. Today’s designers are raised with the vintage of their mothers and keep on recycling what they know. Nobody knows about fabrics anymore, everything is copied, and consumers are not able to boycott the extreme low price industry. Nobody wants to see 14-minute fashion shows with angry models anymore. Who is on your front row is far more covered, journalists are looking non-stop at their smartphone screens and clothes become accessories for the more commercial future IT bags. 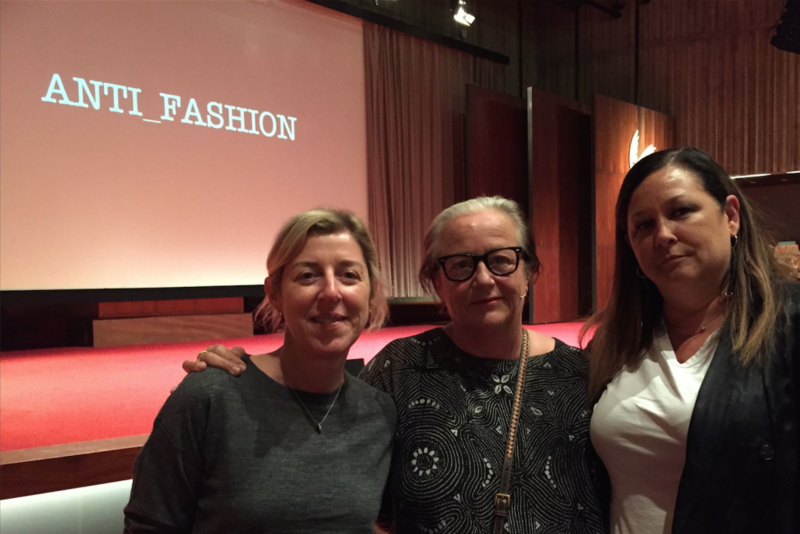 Edelkoort warns the luxury industry to watch out for a fundamental crisis. There is too much, and most of them exist to please their shareholders. Luxe marketing tries to sell their stuff through 1 type of advertising: a group of (every time the same) models, hiding behind the huge IT bag-du-jour. The written press is replaced by a ‘like it’ generation bloggers and Instagrammers without any critique or knowledge on neither fashion culture nor history. And it went on. 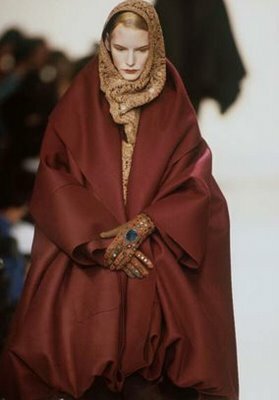 It all came back to this: Fashion placed itself outside society. Besides this statements that make you reflect at least, I loved some of her ideas and thoughts! Because we do can change things, and there is hope. 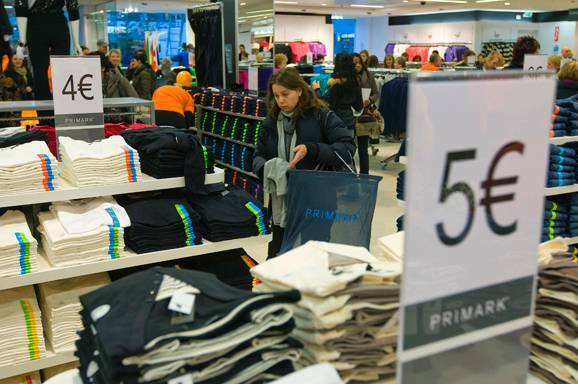 Why not come with a European minimum price for cheap clothing like T-shirts, underwear etc. like we do for food or oil to name a few? Or think about the encouragement of Chanel’s initiative to buy Irish couture weavers ateliers, to save them for the future. They work for Chanel off course, but also for other labels, so the tradition of beautiful handwork is not going to be lost. I certainly left the room inspired. By her, but also by the movement she is part of. A movement that thinks about clothes rather than about fashion. Where we make smaller and better collections, with a focus on making 1 fabulous thing and become a specialist. Return to coupe, fabric, details. I started all ready by repositioning one of my fashion clients towards this new vision of clothing. When this new brand/label is on the market, Li will be the first one to know. Next PostTried & enjoyed: Volta Popcorn, a restaurant popped up in a cornfield.